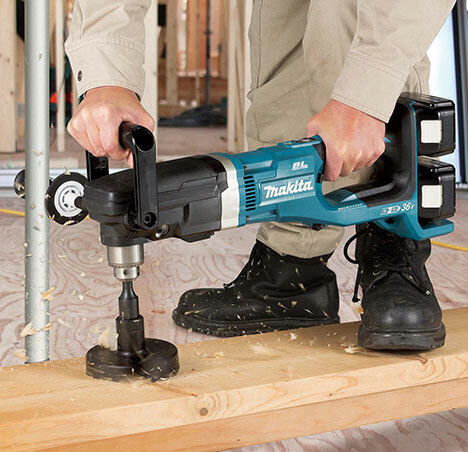 Makita has launched its first cordless twin 18V LXT Brushless Angle Drill featuring all the power and performance of a mains machine whilst benefiting from the freedom and manoeuvrability that only a battery powered tool can provide. The mighty DDA460ZK is powered by two Makita 18V LXT Lithium-Ion batteries giving 36V power from the Brushless motor which not only massively extends runtime but substantially increases power. This new angle drill has a no-load speed of up to 1400rpm in Hi mode and 350rpm in Lo with variable speed control by trigger action. An auger bit of maximum 50mm diameter will make light work of drilling holes in oak beams, even through the toughest knots. This rugged and intelligent mechanical 2-speed machine has a chuck capacity of 2 – 13mm capable of drilling up to 13mm in steel; 118mm in Lo and 65mm in Hi mode when using a self-feed bit in wood or with a hole saw, 159mm in Lo and 105mm in Hi mode. The addition of Automatic Torque Drive Technology (ADT), literally automatically adjusts the drilling speed according to the load conditions to achieve optimum drilling performance, while the auto power-off function automatically shuts down, or times-out, if the trigger is not pulled for five minutes. This body only machine features an electric brake and the soft start function. This accelerates the motor into action even if the trigger is pulled fully home from Off. In drilling mode soft start reduces the sudden torque load on start up. In operation the torque limiter will cut the motor drive should the drill bit snag, so providing further operator protection. The front handle can be installed in any position within 0 – 112.5° for maximum user comfort, control and accessibility in confined spaces. The capacity of the new Twin 18V DDA460ZK LXT Angle Drill will make the toughest tasks completely effortless, including drilling roof trusses, barn conversions and even large steel structures above the open seas.